Comms transformation is the unification of Earned Media Management under one team, workflow and platform, and includes the integration of earned media with marketing’s broader media mix in paid and owned channels. Comms transformation will make it possible for comms pros to optimize campaigns, earn more budget and regain the prestige they’ve lost in today’s modern business environment. The problem PR leaders face when it comes to enacting transformation. How to evaluate whether you have the right people, processes and technology in place. The solution to implement an Earned Media Management strategy. 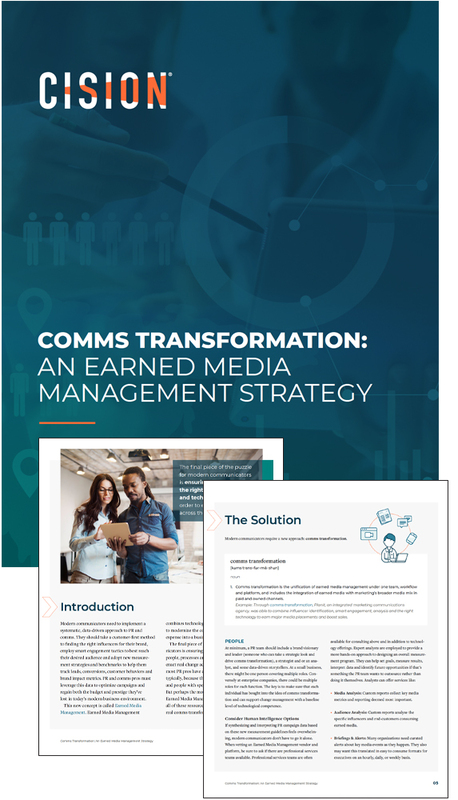 Download Comms Transformation: An Earned Media Management Strategy to get started!